You re here, but you want to be there. Viral sensation and HGTV.com star Erin Loechner knows about the chase. Before turning 30, she'd built a fan base of one million women worldwide and earned the title The Nicest Girl Online as she was praised for her authentic voice and effortless style. The New York Times applauded her, her friends and church admired her, and her husband and baby adored her. In Chasing Slow, Erin turns away from fast and fame and frenzy. Follow along as she blazes the trail toward a new-fashioned lifestyle one that will refresh your perspective, renew your priorities and shift your focus to the journey that matters most. Through a series of steep climbs her husband's brain tumor, bankruptcy, family loss, and public criticism Erin learns just how much strength it takes to surrender it all, and to veer right into grace. Life's answers are not always hidden where they seem. It's time to venture off the beaten path to see that we ve already been given everything we need. We've already arrived. 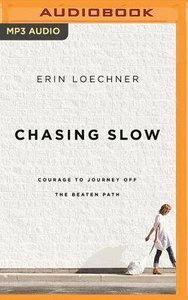 About "Chasing Slow (Unabridged, Mp3)"
A former art director/stylist in Los Angeles, Erin Loechner has been blogging and speaking for more than a decade. Her heartfelt writing and design work has been showcased in The New York Times, Lucky, Parenting, Dwell, Marie Claire, Elle Decor, Huffington Post, and a two-season HGTV.com web special, garnering over one million fans worldwide. She has spoken for and appeared in renowned international events for clients such as Walt Disney World, IKEA, Martha Stewart and Home Depot. Now nestled in a Midwestern town, Erin, her husband, and their toddler strive for less in most areas except three: joy, grace, and goat cheese.